Discuss the Game, Follow/Post Updates The National Under-23 Team, the Black Meteors will TODAY engage in one of the fiercest battles in the qualifying series in a bid to pick a ticket for the Olympic Games, scheduled for Athens, Greece, this year, when they come face to face with the Young Chipolopolo of Zambia at the Kumasi Sports Stadium. The crucial nature of the game has resulted in the gathering of the needed arsenals by both teams as Zambia have also resorted to all forms of mind games, following what they claim is an experience they went through in Benin during the African Cup Qualifying series last year. The Zambians have, however, been given all the assurances by their Ghanaian hosts that they will be given the best of treatment when it comes to reception and officiating, but this kind hospitality will definitely not save them from defeat as the Meteors are poised to go all out in search of honours and qualification. The Ghanaian team have come very far since the days of the All Africa Games in Abuja, Nigeria, where they won a bronze medal at the expense of the Zambians and their qualification to Athens would therefore be an icing on the cake. The match means so much to all Ghanaians because the qualification of the Meteors to Athens would be a consolation for the bleeding hearts of Ghanaians as the Black Stars failed to make it to the 2004 nations cup, just like the Zambians. Aside this, a victory for the Meteors would be a revenge mission for the nation as the same country in 1988, defeated Ghana 2-0 in Lusaka and lost by a lone goal in Accra to pick a ticket to the Seoul Olympic Games in South Korea. 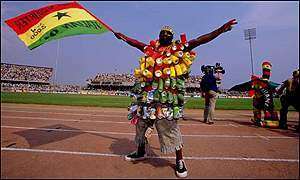 Again, it would mark Ghana's return to the Olympic Games, after being the first African Country to win a medal in the soccer category in Barcelona, Spain in 1992, but failing to make an appearance in Sydney, Australia, four years ago. And above all, this is the true moment for Portuguese coach, Mariano Barreto to vindicate himself and to further prove a point by leading the onslaught against the Zambians, for despite winning two matches on the trot, it is still not enough for the soccer crazy Ghanaians after all since his predecessor, Ralph Zumdick is credited with starting with majority of the work. It is against these factors that the Zambians will not survive on Sunday as the nation cannot afford to lose a perfect opportunity to make it to the Games after so many misfortunes in recent times, whilst the Barreto factor will also play a key role. However, the Meteors, in recent times have seen some improvements in their game, following the defeat of South Africa at their own backyard and it is the prayer of all that a repeat of similar performance against the Zambians will guarantee them the ticket to Athens. The Zambians' noise over the choice of referees among others seem just to be a mind game as a Sports Journalist in Zambia who accompanied their Senior National Team to Benin during the qualifying series of the Nation's Cup accepted the fact that his team was outplayed by the Meteors in the first leg and the Ghanaians would have considered the drawn match as two points lost rather than a point gained. The team has seen much improvement in their performances due to the inclusion of Razak Pimpomg and Ishmael Addo, but in the absence of Addo who was red carded, Isaac Boakye is more than a worthy replacement. Pimpong was a two goal hero when the team beat South Africa in Pretoria recently, whilst there is no doubt that Boakye's inclusion, who is a known deadly striker and considering his recent exploits in Germany and the local league before his departure, but for most fans they still feel it remains a pity that Ishmael Addo will not be around after picking a red card in South Africa. However with support from prodigal son Kwadjo Poku in the attacking machinery, there is no doubt that the team is capable of finding the net on the "D" day to secure the needed victory, though the services of Don Bortey might be missing. The midfield set up of the team will in no way suffer any deficiency following the comeback of Yahuza Abubakari from suspension and a partnership from skipper Yusif Chibsah and Charles Taylor whose expected incursions upfront will supply the needed weapons for the attackers to deliver the goods. Dan Coleman's absence in the defence remains a big minus, considering his contribution to the team in the campaign, but Holland based Yakubu Abubakari is the right replacement for the rugged defender. Abubakari's experience on the international scene is unquestionable and the defensive system, which would be woven around Patrick Villas, Addoquaye Pappoe and John Painstil will be able to provide enough shield for the goal post. In any case Mohammed Alhassan has proven to be a safe hand at any moment due to his recent exploits in the Coca Cola Top Four Tourney. These factors coupled with the massive support from the home crowd will provide the needed tone to ensure victory come this Sunday as Ghana gets set to bounce back to the soccer competition of the Olympic Games. Nevertheless, no one needs to be complacent for the Zambians have also proven to be a force to reckoned with and have well prepared for this game and the fact that they need only a draw to see their dreams through, it is an indication that they will go all out in order to sail through. These coupled with the sound technical guidance from no one else than Kalusha Bwalya is enough warning signal for all, but victory will certainly be for the nation on Sunday as Ghanaians are in no mood to let this chance slip by and suffer another humiliation from the Zambians after almost 24 years.